The Online Results system can be accessed from your SportsTG Membership/Competitions database (as shown below). Alternately, the Online Results system can be accessed from a SportsTG Standard site through the Enter Results link as shown below. This link can be used for Clubs and Teams to access the Online Results system using their Club or Team username and password. Note: Associations will also be able to log in from this link. Below is the Match List Screen. This will be the first screen that comes up when entering the Online Results system from your Membership database. Handy tip: When filtering out Matches by Venue Name or Competition Name it is good practice to copy the name of the venue or competition from your database and paste it in the fields above. It will search for the exact Competition or Venue name, so if you leave out an apostrophe or a hyphen the matches won’t display in the Match List. When logged in to the Online Results system at Association level matches can be so locked the levels below cannot access the matches to edit them. To unlock a match simply click on the Lock symbol and click Update Lock Status to save the changes. The Enter Quick Results option will give the ability for the Result of a match to be entered in quickly and easily from the Match List screen (shown below). Quick Results entry will just give the option to enter in a Win/Loss result for a Match; specific results for those matches can then be added at a later stage if required. All match administration can be conducted through the Pre-Game and Post-Game buttons on the far right hand side. The Pre-Game Screen (shown below) houses all the pre-game administration including team selections, assigning team officials and accessing team sheets. 1. Game Information – This contains details of the match being edited. 2. 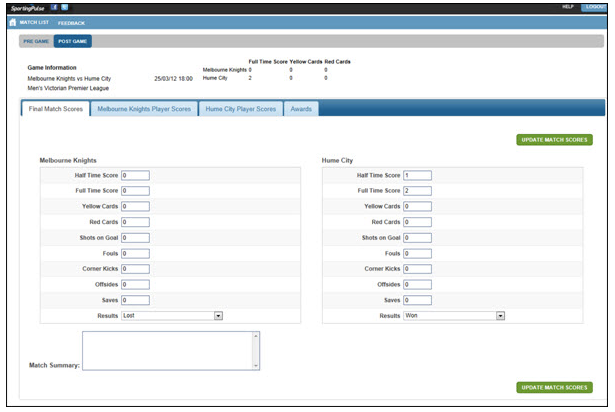 Pre-Game Dashboard – The dashboard will show the current number of players and coaches/officials selected for either team. 3. Team Tabs – Two tabs across the top house the information for both teams. 4. Manage this Display List – This will give you the option of filtering out members for team selection by ‘All Club Players’, ‘Players registered to this team only’, ‘Players to this age group’ or ‘all Financial club players’. 5. Autoselect Players – This will give you the option to Auto-Select your players by either players who played last week or players registered to the team. 6. Available Players – This is the listing of all players available to be assigned to the match. 7. Selected Players – All members you have assigned to the match will appear in the Selected Players box and player positions and numbers can be assigned from there. 10. Reset Match – This will reset ALL data currently entered in for the match. 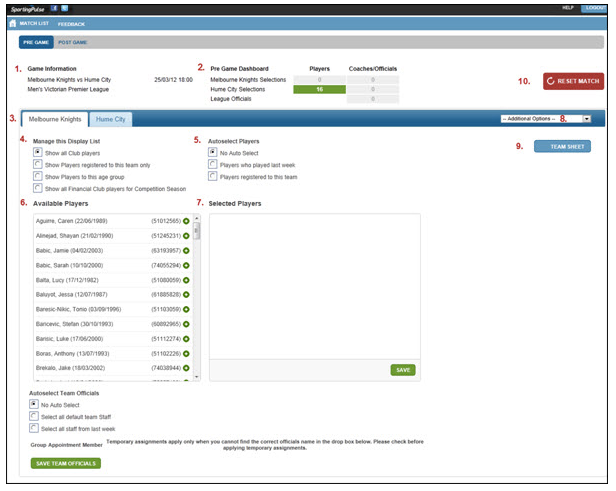 The Post-Game Screen (shown below) houses all the post-game administration including team statistics, results entry and individual player statistics. 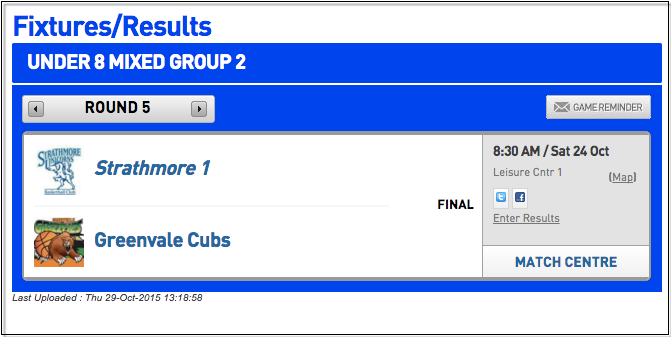 Final Match Scores – All team match data will be entered in for both teams on this screen. To save the results from a match, click Update Match Scores. A value from each Results field (ie. Won and Lost or Draw and Draw) will need to be selected to save the match data. Team Tabs (Player Scores) – All match information for specific players from each team can be entered in on the screen below. Each team has their own tab and all players selected for the match will appear for their respective teams. Awards – If Awards have been set up by the Association or Club the votes for the awards can be entered in through the Awards tab.